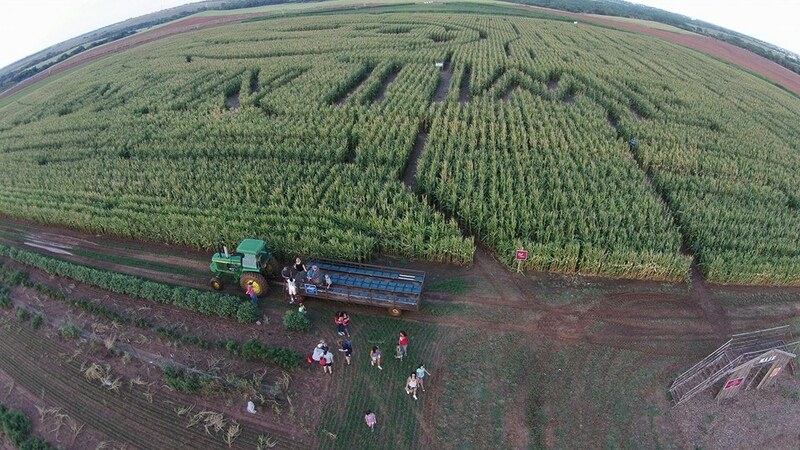 We started with just a corn maze but we continue to grow every year by adding new attractions. Take a look at some of our activities offered during our fall season! Over 1 and 1/2 miles of twist and turns, are you up for it? A new design every year provides a continued challenge . There are 10 stopping points throughout the maze with trivia questions to help give some hints. The corn maze is divided into 2 halfs so you can take a break in between to visit our Country Store for a snack! Looking for our pumpkin patch? Hop on a hayride and arrive to the pumpkin patch in style. We understand that allergies can be tough so we have a hay-less hayride so more guest can enjoy. It would not be a trip to a farm without picking the perfect pumpkin. Do you love sunflowers? Then you have to visit our large sunflower field, it makes the perfect backdrop for pictures. Our sunflowers bloom in mid September. All aboard, the P Bar Farms barrel train ride is a favorite for our youngest guest. Pigs, goats, rabbits, donkeys, chickens, alpacas and even a Zubu call P Bar Farms home. They'd love to meet you! Forget the sandbox and enjoy paying in our corn pit. It's guaranteed to put a smile on your face! Enjoy milking our cow, we promise she'll stay still. Feeling brave? Join us for our Haunted Maze, starting on the first Saturday of October at Dusk. Check our hours to get the exact date and times for our Haunted Corn Maze.